Shealeen Puckett balance their angsty cool pop with a folky twang that keeps you hip and hipster at the same time. The duo, who hails from Nashville, goes for more pop in Pretty Speeches, which we can hear in tracks “Get to Me” and “Forget You In LA.” The latter has a familiar message of heartbreak, but with mellow vocals and an experimental melody filled with west coast vibes. However, it’s not the typical pop music you’d expect. There’s a certain laid-back approach with angsty drawl vocals paired with folky, smooth melodies. It’s like a combination of 80’s pop with early 2000’s pop. You can hear edgier laidback vocals in “Enough Messing Around” which has a bit of authority and vengefulness behind the song. The opening track “Go Away” has a Hawaiian twang that combines effortlessly with lazy-but-not-so lazy vocals. You can also hear a bit of alternative country twang that pay homage to their Nashville home. “Madeline” is a slow and smooth song to end the EP. The vocals are enchanting that follow a simple and ethereal guitar melody. Pretty Speeches sums up what we expect from our perfect summer. They tease us with five songs that have us daydreaming about long cool nights, beach vibes, and endless time to do nothing. 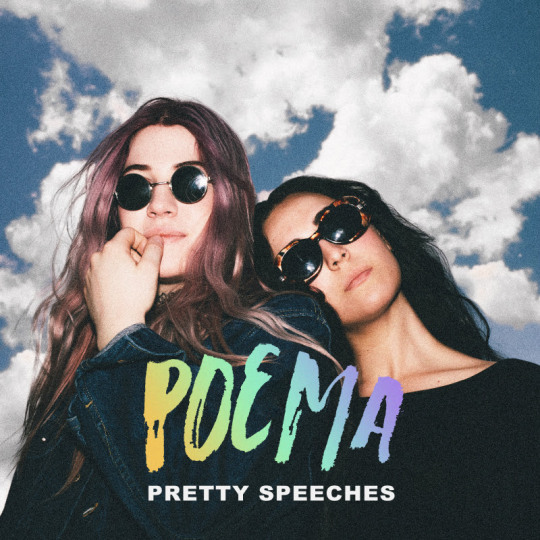 Poema manages to capture the essence of cool girl indie pop music in their new EP and leaves you wanting more.